30 days and counting… until the new 2011 Spring/Summer lia sophia catalog is available! In preparation for this I will be doing a series of 8 posts covering the new styles that will be coming to an advisor near you very, very soon. In each I’ll talk about a section of the catalog along with highlighting a few new pieces that have caught my attention culminating in another New Catalog Bling Giveaway with post 8. Spring may seem far away in many places right now with all the weather stories of multiple feet of snow piling up in places like Arizona and New York, but it is coming and you can bring a touch of Spring into your life without relying on Mother Nature with the Spring Bling selections. 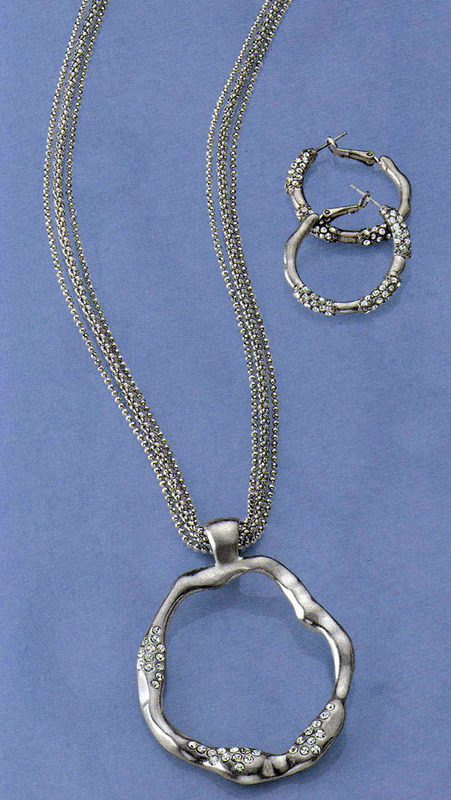 Filled with airy simple silvers and bright colors these pieces really will brighten your day. Lovers of the floral statement necklace check this out. 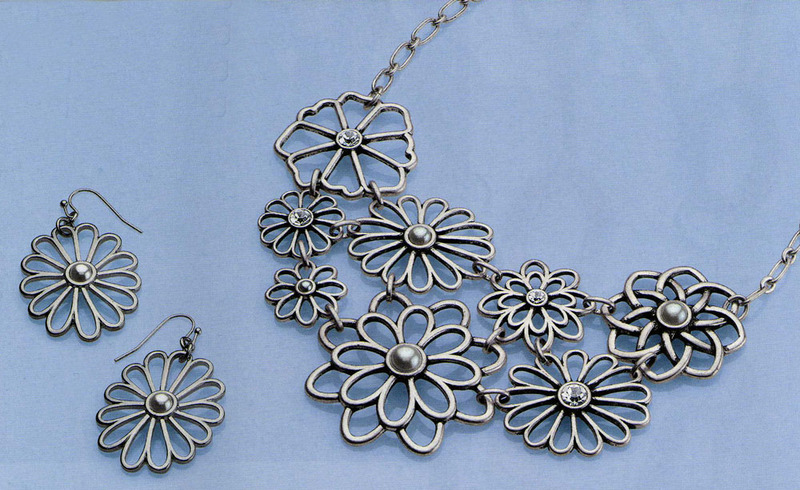 It’s not quite as ornate as some necklaces in this trend, but these cut-out matte silver flowers accented with creamy resin and cut crystals make for a versatile and memorable addition to your jewelry wardrobe. Pair it with a button-up for work, a t-shirt for day or your little black dress for a night out. Wanderlust may not strike everyone, but it certainly has me. Not only do I love traveling, but I also love this set. Simple with a bit of edge, this hammered silver necklace and earrings with cut crystal accents yet again make for a set that can easily go from work to play as well as accent a wide variety of colors and styles. What about those bright cheery colors? 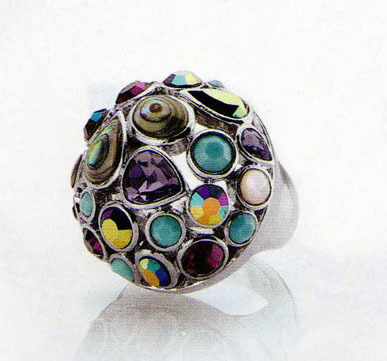 Here’s one example in the form of a lovely mosaic cocktail ring accented with genuine Abalone, Mother-of-Pearl and cut crystals in an array of purples and teals. I only plan to cover a few pieces in each post, but when I saw this necklace I had to include it. 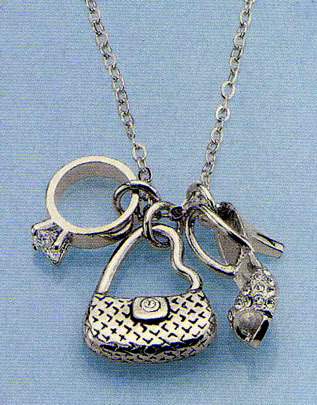 This simple charm necklace feature three things every woman needs – a cute purse, hot shoes and bling. In fact that bling has a CZ weight of 0.7ct. Not bad for a charm ring. As always with lia sophia, all of these pieces qualify for the Customer Save Plan (Buy 2, Get a 3rd more expensive at 1/2price). They also all would fall into the $15 hostess bonus range, even the Bouquet necklace which would be 85% off with the hostess pricing.